Social Networking Not Carrying its weight for traffic generation. So who/what is? Surprise! 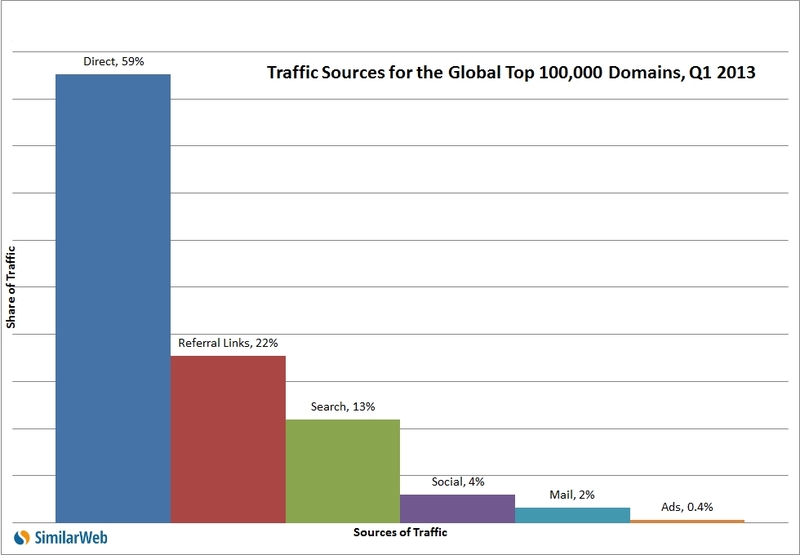 Digging into our industry leading user panel, we aggregated classification data on the types of traffic sources for the top 100,000 global domains. This gave us an interesting, wide angle, perspective on trends and numbers that we typically only show for individual domains. At SimilarWeb, our speciality is competitive intelligence and most users apply our data to small collections of websites. We help users love their competitors by learning from their online strategy. But at our core, we are a big data company. As I type this now, just across the room, teams of the best data scientists in the industry are nose deep in Hadoop, keeping our racks of servers humming in order to slice and dice the data that you see as SimilarWeb. But what if we did less slicing and more chunking? What if we wanted to look at what traffic looks like on the internet as a whole? As you would imagine, direct clicks dominate internet traffic with more than twice as many visits being generated by direct traffic as even refferal links. Search, the revenue driver that pushes the likes of Google forward, is strong at 13% of global traffic. Mail traffic is a miniscule 2% of global traffic, disappointing spammers and grandmothers the worldover. What’s most surprising is that social traffic only accounts for 4% of all traffic sources. Perhaps one reason for Facebook’s low contribution is that Facebook has built the internet’s most appealing walled garden, only with ex-girlfriends and stalkers instead of tea and lillies. Like Vegas, clicks that happen in Facebook stay in Facebook. Users tend to click on other user’s pictures and profiles, staying comfortably within the confines of the site. Paid Referral Traffic: Where’s social? What about the clicks you have to pay for? Where do they come from? Display ads dominate, followed by search. However, the fact that search ads even approach display ads in the amount traffic they generate is a testament to the power of PPC ad networks like Google Adwords. Remember, the 55% of paid traffic driven by display ads accounts for display advertising across the entire internet. Basically, we’re talking about every banner you come across on the web. However, the remaining 45% of traffic attributed to search only comes from a handful of search sites–and let’s be honest, we’re mostly talking about Google search. This means that search ads create almost as many clicks as every other ad on the internet. Social ads are, again, at the bottom of the pack. Despite Facebook’s massive engagement numbers and huge amount of ad impressions, its contribution to global paid traffic remains significantly lower than search and display. Our data just doesn’t show Facebook driving a significant amount of paid traffic to outside websites. However, Facebook ads might be very effective at directing users to internal pages within Facebook. Yet again, Facebook does an incredible job attracting users and keeping them inside Facebook. None of this should discredit Facebook’s strength on the internet. According to (our soon to be released) SimilarWeb Pro, Facebook’s share of global traffic is a staggering 28.34% (not even including mobile) and has remained steady for the 6 months. Even more incredible are its engagement figures. A user’s average time on Google is less than half of Facebook’s, with only YouTube nearly matching Facebook’s fantastic stickiness at an average time on site of 20 minutes. For the last few years, social has been the undisputed buzzword of the internet. According to the journalist Steven Levy, Google was so spooked by Facebook, it dedicated two entire floors to becoming social and named the project Emerald Sea, placing a 1878 painting by Albert Bierstadt of a shipwrecked boat caught in a wave at the entrance of the project’s nerve center. Indeed, as a category, social has substantial internet traffic reach and knows how to engage users. But the online advertising ecosystem is about sending users from one site to another. In this respect, the social revolution might be overrated. As a share of aggregate referral traffic, referral links and search still dominate the organic clicks landscape, with display and search ads cleaning up paid clicks. A user searching for information has a natural incentive to jump from site to site. But a user who visits Facebook–or for that matter, Google+, Emerald Sea’s successor–goes there as a destination; a place to spend time. For an industry concerned with monetizing referral traffic, the classic players seem poised to continue doing just fine.